Successfully Added The Robot - 2.8 Inch Touchscreen Cellphone with Android OS to your Shopping Cart. Welcome to 2010, a new year and a brand new phone. The Robot Android OS cell phone is here. With plenty of great apps, Wifi, and being fully unlocked, this is THE mobile phone for people who enjoy taking control of their communication experience. With a Samsung 2448 400Mhz processor for quick response time along with the user-friendly Android OS environment, you can make phone calls, send text messages, create media enhanced picture messages, and much more inside the phone's richly enhanced GUI menu system. Better still, you have instant access to all of your favorite Google applications like Gmail, Google Maps, Google Search, and Google Talk. Much like a mini netbook computer, the Robot Superphone lets you do so much more than a regular cell phone. Already pre-loaded with over 20 apps, you can instant message, send email, check the weather, read your favorite RSS feeds, and do so much more with a single cellphone. With all those pre-loaded applications on the Robot Superphone you can already communicate with friends, family and colleagues in every way possible, but that is not all! New tools and toys are constantly being developed for the Android OS which you can download from the Google Apps store or other internet sites onto your microSD memory card (a 2GB card is included free!) to run on your new Superphone. Since Android is an open-source operating system, you will be able to enjoy a constant stream of new, exciting, and often free selection of software to enjoy on your new Robot Superphone. You can also use the phone's wireless connection to surf the internet on wifi wireless hotspots. Not only will this allow you to be more productive and enjoy your free time more, but when you surf the internet on your wifi connection - it is free, with no need to use up your cell phone data plan minutes! If you are in the market for a new phone for yourself or the one you love, then this is the phone for you! The Robot Superphone is designed to be the most interesting phone you have ever owned. Made for today's busy lifestyle, this mobile phone really will cater to your every need, whether you are a corporate exec or soccer mom. It is in stock in our warehouse right now for single piece or large bulk purchases, so order yours today and we will express ship it out tomorrow! 2GB microSD memory card is included free! Power phone for power-users, but at a low wholesale price! Sound & Display: Silent Mode, Ring Volume, Media Volume, Phone Ringtone, Phone Vibrate, Notifications Ringtone, Audible Touch Tones, SD Card Notifications, Animations, Brightness, Screen Time Out. First, go to www.andappstore.com using your computer, and download an app called "AndAppStore", This app lets you access the (free) store directly on your new Robot Android superphone and download apps, wallpapers, pictures, and more. Download the "AndAppStore" and install it via the included Micro SD card, then run the File Manager on the Robot superphone, and install the "AndAppStore". Note: The Android OS version on this cell phone cannot be upgraded or flashed and any attempts to modify the default OS will void the warranty. As a wholesaler, Chinavasion provides no software support, advice, or training regarding the Android operating system and software. Got this phone really quick (4 days delivered to the Netherlands). The only issue I had - the wrong IP address configured in /etc/hosts - the phone wasn't able to connect to Google. Used Android SDK to change the IP address to the one which resolves here and everything worked out as a charm. I like this phone. Overall quality is good. This phone is good for its price tag, however , the battery drains out really quickly when either Wifi or Bluetooth is on all the time. 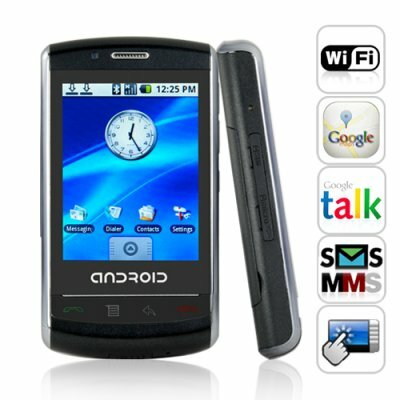 True Android phone for small price. All know but is not big. Fine phone, the best variant for this price.